During the last week and a half of July 2000 a group of American scientists and students are journeying to Iran to participate in an international scientific conference on comets. This conference, to be held in the city of Esfahan from July 22--24, was organized by and is being hosted by the Adib Astronomical Society in Esfahan, and was planned to coincide with the appearance of Comet LINEAR (C/1999 S4) in the nighttime sky. In addition to the American delegation there will be participation from several European and Asian countries as well as by several astronomical organizations within Iran. After the formal completion of the conference the American participants will stay a few extra days in Iran to visit historical sites around Esfahan and Shiraz. 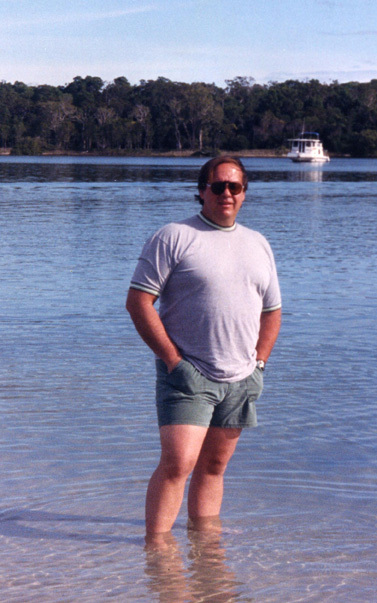 The American delegation is being led by Alan Hale, the Director of the Southwest Institute for Space Research [now the Earthrise Institute] in New Mexico and co-discoverer of Comet Hale-Bopp. Other participants include: former astronaut Bruce McCandless, co-developer of the Manned Maneuvering Unit used by Space Shuttle astronauts during the 1980s; Doug Biesecker, astronomer at the Goddard Space Flight Center in Maryland who works with the SOlar and Heliospheric Observatory (SOHO) project; Charles Morris, astronomer at the Jet Propulsion Laboratory in California and host of the Comet Observation Home Page; and Herman Heyn, "sidewalk astronomer" from Baltimore, Maryland, who earlier this year performed a 600-mile bicycling "street-corner astronomy" tour of Cuba. Much of the trip was made possible by diligent work performed by the organization Search for Common Ground. This trip builds upon contacts that were established during the Institute's expedition to Iran in August 1999 to observe the total solar eclipse that took place that month. (Search for Common Ground was of enormous assistance in bringing that trip to pass as well.) It is the wish of all the participants in this endeavor, both American and Iranian, that this conference will help in fostering greater international scientific collaborations and in bringing all the peoples of planet Earth closer together. 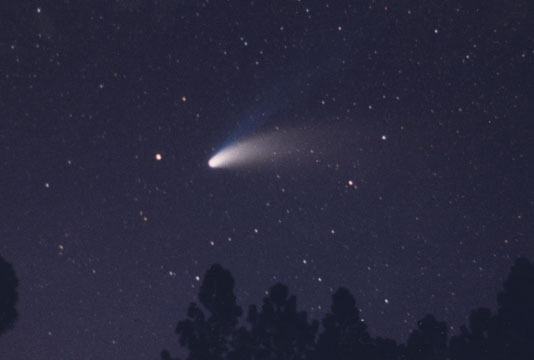 Top left: Comet Hale-Bopp, April 1997, from Cloudcroft, New Mexico. Photo by Alan Hale. 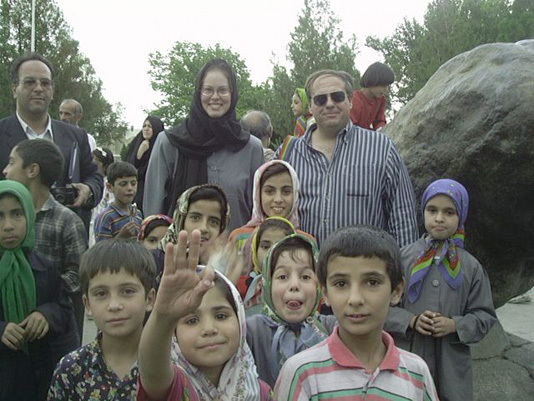 Top right: Alan Hale (right) of the Southwest Institute for Space Research, and Stacy Heen of Search for Common Ground, together with numerous Iranian children, at the "stone lion" in Hamadan, Iran, August 1999. Photo by Doug Biesecker. Below left: Alan Hale, of the Southwest Institute for Space Research [now Earthrise Institute]. Photo by Eva Hale. Above center: Comet LINEAR C/1999 S4, on July 4, 2000. CCD image by Charles Morris. 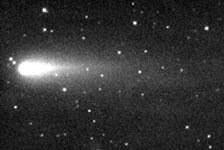 Below center: Comet C/1996 Y1, one of numerous "sungrazing" comets detected with instruments aboard the SOHO spacecraft. NASA/ESA image, provided by Doug Biesecker. 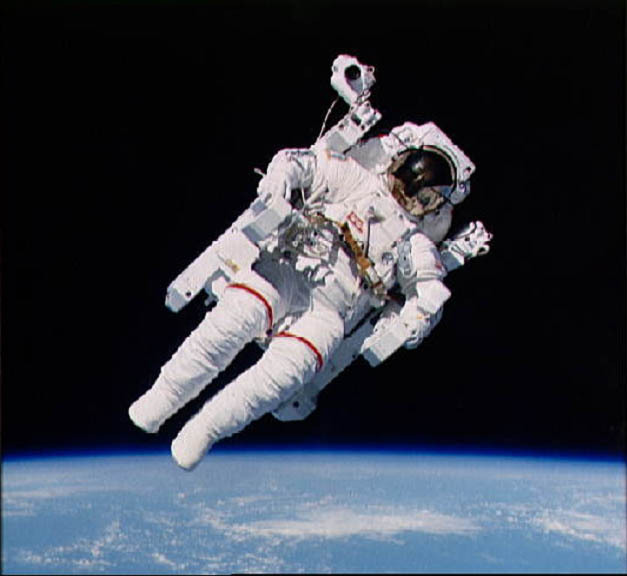 Above right: Bruce McCandless, in the Manned Maneuvering Unit, Space Shuttle mission STS-41B, February 1984. NASA photograph. 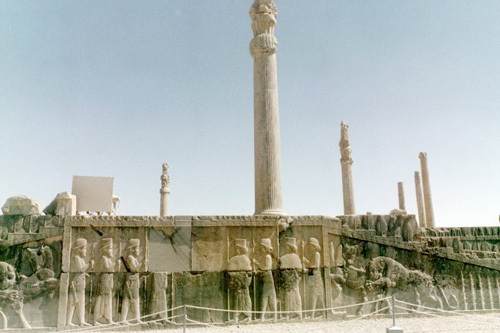 Below right: The ruins at Persepolis, near Shiraz, Iran, August 1999. Photo by Alan Hale.